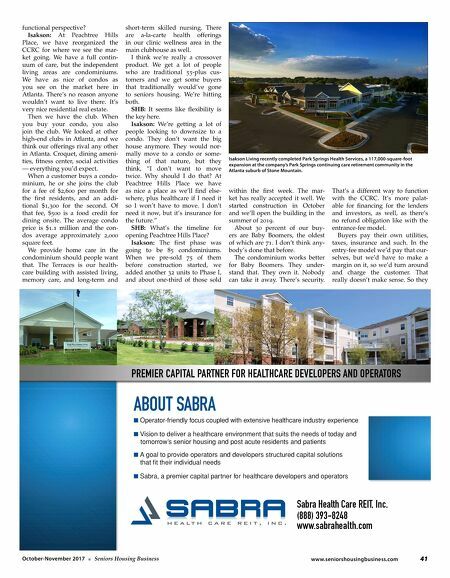 www.seniorshousingbusiness.com 41 October-November 2017 n Seniors Housing Business functional perspective? Isakson: At Peachtree Hills Place, we have reorganized the CCRC for where we see the mar- ket going. We have a full contin- uum of care, but the independent living areas are condominiums. We have as nice of condos as you see on the market here in Atlanta. There's no reason anyone wouldn't want to live there. It's very nice residential real estate. Then we have the club. When you buy your condo, you also join the club. We looked at other high-end clubs in Atlanta, and we think our offerings rival any other in Atlanta. Croquet, dining ameni- ties, fitness center, social activities — everything you'd expect. When a customer buys a condo- minium, he or she joins the club for a fee of $2,600 per month for the first residents, and an addi- tional $1,300 for the second. Of that fee, $500 is a food credit for dining onsite. The average condo price is $1.1 million and the con- dos average approximately 2,000 square feet. We provide home care in the condominium should people want that. The Terraces is our health- care building with assisted living, memory care, and long-term and short-term skilled nursing. There are a-la-carte health offerings in our clinic wellness area in the main clubhouse as well. I think we're really a crossover product. We get a lot of people who are traditional 55-plus cus- tomers and we get some buyers that traditionally would've gone to seniors housing. We're hitting both. SHB: It seems like flexibility is the key here. Isakson: We're getting a lot of people looking to downsize to a condo. They don't want the big house anymore. They would nor- mally move to a condo or some- thing of that nature, but they think, "I don't want to move twice. Why should I do that? At Peachtree Hills Place we have as nice a place as we'll find else- where, plus healthcare if I need it so I won't have to move. I don't need it now, but it's insurance for the future." SHB: What's the timeline for opening Peachtree Hills Place? Isakson: The first phase was going to be 85 condominiums. When we pre-sold 75 of them before construction started, we added another 32 units to Phase I, and about one-third of those sold within the first week. The mar- ket has really accepted it well. We started construction in October and we'll open the building in the summer of 2019. About 30 percent of our buy- ers are Baby Boomers, the oldest of which are 71. I don't think any- body's done that before. The condominium works better for Baby Boomers. They under- stand that. They own it. Nobody can take it away. There's security. That's a different way to function with the CCRC. It's more palat- able for financing for the lenders and investors, as well, as there's no refund obligation like with the entrance-fee model. Buyers pay their own utilities, taxes, insurance and such. In the entry-fee model we'd pay that our- selves, but we'd have to make a margin on it, so we'd turn around and charge the customer. That really doesn't make sense. 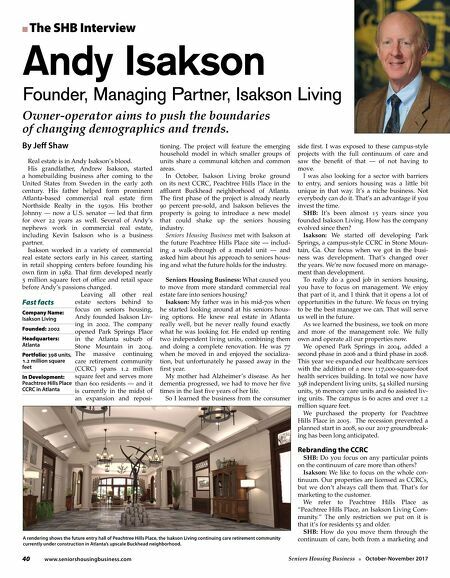 So they Isakson Living recently completed Park Springs Health Services, a 117,000-square-foot expansion at the company's Park Springs continuing care retirement community in the Atlanta suburb of Stone Mountain.